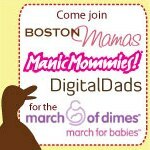 Friends, I was so happy to walk in yesterday's March for Babies (which had an impressive turnout despite the downpour preceding the walk), and am enormously proud of all of the funds raised by Team Boston Mamas & Friends. We raised $7,762 for the March of Dimes, and I am especially grateful to my sister Stephanie (our runaway top fundraiser at $3,915 -- she matched her donations dollar for dollar! ), and to Carissa, Angela, and Christina, who all raised $500 or more (I was also thrilled to meet my personal fundraising goal). Amazing efforts all around and we couldn't have done it without the generosity of many people. Thanks to everyone who supported our team!